The activities of the marine aggregates and marine mining sectors can be broken down by: i) the extracted materials (sand and gravel) ; ii) the location where the activity takes place (shallow mining or deep sea mining). Shipping operational and service activities to/from the delivery place (i.e. ports) are not considered in this sector fiche. Specific FAQs regarding this sector can be found at the bottom of the page. The following questions provide overall information on current spatial needs and anticipated future developments. What are the present spatial needs of the Marine Aggregates and Marine Mining sector? The marine aggregates and marine mining sectors are locked in physically to the specific location where geological processes lead to those materials to be extracted. Thus, the spatial aspect is of the greatest importance for these sectors, as the spatial availability of the resource cannot be altered. A re-allocation of the activity would therefore not be possible. The material transport to ports also follows a linear structure connecting the collection point to the point of delivery, which will follow the most direct route in order to minimize shipping costs. In order to avoid potential spills, during extraction all other uses are to be spatially avoided so that focus remains on a safe exploration (especially for deep-sea mining development). Maritime spatial plans and mapping can identify potential geological resources allocated zones that are far bigger than the locations where eventually the actual dredging may will take place in the future (thrpugh “mineral safeguarding”). Which anticipated future developments of the industry are relevant to MSP? The increasing scarcity over the supply of raw and non-living material, tends to push some countries (i.e. UK, Belgium, Netherlands and France) out into deeper waters further offshore to look for new material´s supply zones. This pushes the technological capacity of boats that will have to operate at deeper waters (larger boats) with more powerful equipment. Important technological challenges still exist for marine mining in deeper waters. Align planning cycles: An effort should be made to ensure that the planning cycles of MSP are aligned with the temporal scope of the sector. Multi-use planning: The marine aggregates sector can be included in multi-use planning, and it can be combined with marine protected areas as well as offshore renewable energy, military activities or the fisheries sector, as long as there is proper assessment and management. Sustainable extraction: For the marine mining sector, the greater driver is to ensure that extraction is sustainably managed and minimizes potential effects on the environment and other marine uses. the MSP Platform Sector FAQ page which includes those frequently asked questions relevant to the sector. EEA (2015). State of Europe’s Seas, Technical report No.2/2015. Copenhagen: European Environment Agency. Ahnert, A., Borowski, C. (2000). Environmental risk assessment of anthropogenic activity in the deep-sea. Journal of Aquatic Ecosystem Stress and Recovery. 7(4): 299–315. Velegrakis, A.F., Ballay, A., Poulos, S., Radzevicius, R., Bellec.V., Manson, F. (2010) European marine aggregates resources: Origins, usage, prospecting and dredging techniques. Journal of Coastal Research. Journal of Coastal Research. 51: 1-14. Otay, E. N., Work, P. A. and Börekçi, O. S. (n.d.). Effects of marine sand exploitation on coastal erosion and development of rational sand production criteria. Report in possession of authors. Klinger, D.H., Eikeset, A.M., Davíðsdóttir, B., Winter, A-M., Watson, J-R. (2018). The mechanics of blue growth: Management of oceanic natural resource use with multiple, interacting sectors. Marine Policy, 87: 356-362. ISSN 0308-597X. Interview with Blue Mining Project coordinators on 02nd August 2017.http://www.sciencedirect.com/science/article/pii/S0308597X17305869doi  10.1016/j.marpol.2017.09.025. What is the current status of the marine aggregates and mining sector in Europe? Marine aggregates and mining can be broadly separated into three separate groups, marine aggregates extraction, marine mining and deep-sea mining. In 2015 the European Environment Agency published a technical report on the state of Europe’s Seas . This stated that the mining of aggregates, considered to be a mature sub-sector, has an estimated GVA of EUR 625 million and provides approximately 4,800 jobs in Europe. Due to increasing levels of erosion, morphological environmental changes coupled with the threat of sea level rises and climate change impacts, the need for land reclamation and new development sites this expected to increase. In addition to the aggregates industry, the seabed is also a major source of a variety of minerals and metals, in particular those used in high-tech industry and other rare earth metals (e.g. iron ore, tin, copper, manganese, cobalt, beryllium, germanium, neodymium, gold, graphite, sulphides and phosphorites). This sub-sector is still undergoing a period of growth. Deep sea mining can be considered an emerging / exploratory sub-sector according to numerous sources (e.g. Miller et al 2018 ). However, the industry faces numerous challenges, such as uncertainty regarding the environmental impacts in relatively unexplored marine ecosystems, the technological difficulties of mining in such remote areas and the associated high economic costs. Nonetheless, depletion of land based resources coupled with higher demand of such materials is expected to result in rapid sub-sector expansion. Where are the geographical hotspots for marine aggregate and mining activities within European Seas? Activity within Europe at present is predominantly focussed on marine aggregate extraction rather than mining activities. 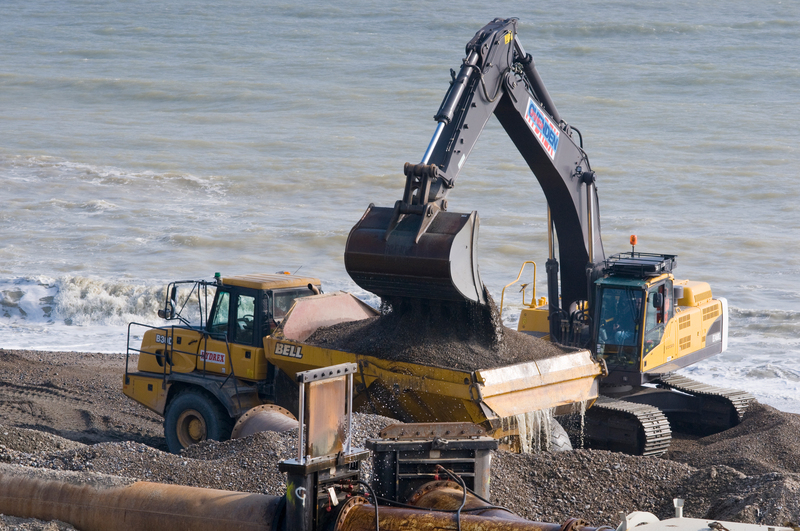 According to EMODnet every year, more than 50 million m3 of marine aggregates, mainly sand and gravel, are extracted from the European marine seabed, mostly for the construction industry and for sea defence construction. The biggest European aggregate extractor countries at the present time are the Netherlands, the UK, Denmark, France and Belgium. The available geodatabase on EMODnet , annually updated, contains information on aggregate extraction sites in the EU. Most of the data relate to the Atlantic area; information from the Black Sea and the Mediterranean Sea countries is scarce at present. What information sources are available regarding Marine Aggregate and Mining Activities which are useful in a Maritime Spatial Planning context? One of the best sources for information which can assist planners is the website for the European Aggregates Association (UEPG ). The UEPG represents the industry and includes members from 26 countries. The organisation represents its National Member Associations on health and safety and environmental, economic and technical policy. It publishes information and case studies to assist them. The UEPG considers that the establishment of a sound statistical database is essential and each Member is encouraged to provide accurate and comprehensive data. Statistics available include examination of current industry trends and production data from 39 countries. Another open source of information available is the European Atlas of the Seas  which is a tool for professionals and all those interested in learning more about Europe's seas and coasts, their environment, related human activities and European policies. In the context of the EU's maritime policy, the Atlas offers a diverse range of information on topics and sectors. For example, one of the predefined maps for the sea bottom shows the location of seabed sediments and deep sea mineral deoposits which have been identified in European seas. The European Marine Observation and Data Network (EMODnet)  is a network of organisations supported by the EU’s integrated maritime policy across 7 disciplines including human activities in our seas and oceans. The data available on EMODnet has also been used to create a series of multi-resolution maps of all Europe’s seas and oceans. Maps showing the location of currently active and inactive extraction sites are available via the human activities central portal.